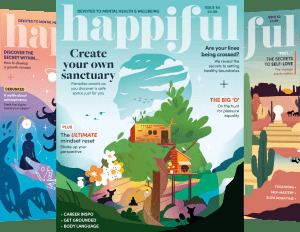 For February’s edition of Happiful Magazine, Kem Cetinay has shared his experience of Post-Traumatic Stress Disorder (PTSD), anxiety and depression. Kem, star of Love Island and Dancing on Ice, spoke to Happiful, the only magazine devoted to a positive conversation around mental health, about his experience of anxiety, depression and PTSD. Thankfully, his mum Figen pulled through, but the event had a significant impact on Kem, and he was later diagnosed with post-traumatic stress disorder and depression. Kem went to a therapist when he was a teenager and he credits this experience with helping him to control his anxiety and panic attacks in particular. Kem told Happiful magazine that he still experiences anxiety and depression but feels he is better at dealing with it. He has cut down on alcohol, after realising it gives him sky-high anxiety, and is careful not to take on too much work at once. In 2019, he will start a school tour with Childline, delivering speeches at schools across the UK. Kem believes that if he had heard someone speaking about mental health while he was at school, he would have addressed his challenges sooner. Read more of Happiful's interview with Kem Cetinay in issue 22, on sale now. Visit the Happiful shop to get your print copy or read free online.